This must be the fastest project ever accomplished by city government – or at least this City’s government. The funding source makes a huge difference: The city is using its own money, using “mini capital project” funding that was budgeted but not yet allocated. If the city was using grant money from the state or federal governments, a four-week turnaround time for a protected bike lane would not be possible. The pace continues at breakneck speed! On Tuesday, Chicago Department of Transportation (CDOT) crews were working on both the eastbound and westbound directions on the west side of the Kinzie Street bridge. Crews work on the eastbound Kinzie Street at Canal Street, right before the bridge. It does not appear there’s a buffer here (guide lines painted before the stripes aren’t seen). Painting stripes on eastbound Kinzie Street at Canal Street, right before the bridge. CDOT workers inspect the stripes at the stop bar and crosswalk at eastbound Kinzie Street at Canal Street. It appears the stop bar is further from the crosswalk than at most intersections in Chicago. Photo of workers (from StreetPrint?) applying green paint to a bike box and left turn lane on southbound Milwaukee at Desplaines/Kinzie. Photo by Thomas Gonzales. Updated June 15, 2011: Added section on snow removal for the Kinzie Street bike lane. Updated October 16, 2011, to add quotes protected bike lane planning. As I suspected, construction began today, Monday, June 6, 2011, on Chicago’s first 0.5 miles of protected bike lanes at Kinzie and Desplaines. Chicago Department of Transportation employees were out on the street this morning striping the bike lane and bike lane buffer, as well as a painted “median” at the start of the bike lane that will presumably keep out automobiles. Looking east on Kinzie from Desplaines, down hill. More photos. Looking west on Kinzie from Jefferson, up hill. More photos. 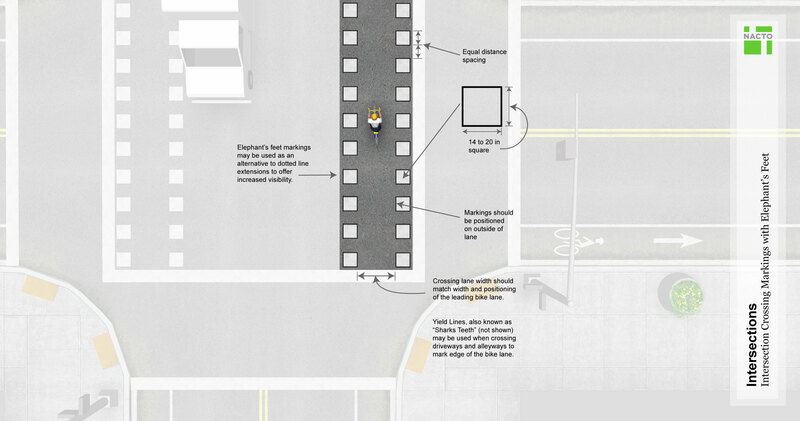 The configuration is probably a 5-feet bike lane, 3-feet buffer zone (which will soon have soft-hit bollards), 8-feet car parking lane, and 10-feet travel lane. As of 9:30 AM this morning, when the photos were taken, crews had not worked on westbound Kinzie Street. See the complete photo set on my Flickr with photos by Brandon Souba. Keep up with the discussion (from people both optimistic and pessimistic about this project) on The Chainlink. Read my previous posts about this project. Follow the discussion on Chicagoist (although much of it centers around the law allowing bicyclists and motorcyclists to go through red lights in specific circumstances). After reading about the new protected bike lane on Kinzie Street, people are speaking up. I have to admit that this doesn’t seem to be a location that fulfills any of the criteria I just mentioned – it seems instead to be directed at people who already are bicycle commuters to the Loop, largely young, fit adults. I don’t think they are the people who can benefit from a track and it should be placed elsewhere. Excerpted from Protected bike lanes get a wobbly start. While the safety improvements will become clear in the crash statistics, there are a lot of things that can make a bikelane good or bad from a user perspective. They should have a formal evaluation process after 6 months or a year to see what works what and what doesn’t. Excerpted from their comments on The Chainlink. I’m a big fan of protected bike lanes, but starting this lane at Milwaukee/DesPlaines just seems like a remarkably bad idea to me. The problem is that there’s a very steep downhill decline between Desplaines and Clinton. That means you constantly have lots of bikes traveling at very different speeds, and this lane is going to trap them in a small space designed for slower speeds. Right now, this works fine because the cyclists spread out all over the right lane (because of the downhill speeds, taking over the lane is no problem). Excerpted from Saturday’s post on Steven Can Plan. Your photos remind me of another problem with this specific location, as you often have a Blommer truck parked on the westbound side with a large hose running between the truck and a nozzle on the side of the building. This hose will have to run across the protected bike lane. You’re going to have to have bicyclists either jump between the dividers into the traffic lane to go left of the truck, or stop and lift their bikes over the hose. Any advice on which option is the more reasonable for bicyclists? From their comment on Chicagoist. Find more naysaying on this Chicagoist article. 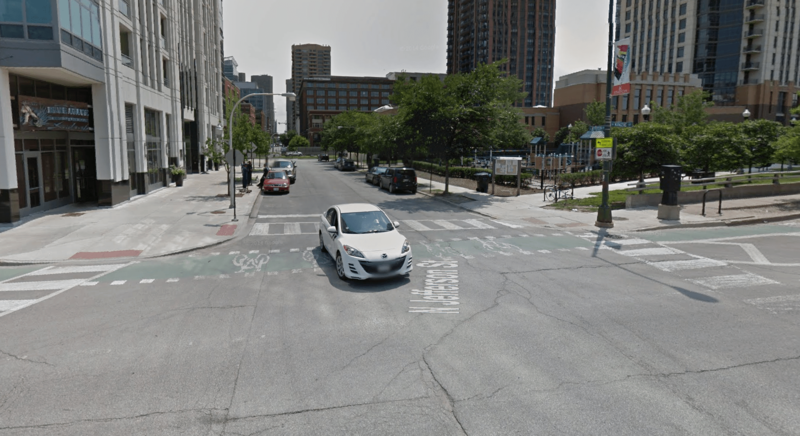 What are your thoughts on the location, protected bike lanes, or bicycling in Chicago? A group of people riding their bikes wait at the light at Division and Milwaukee, going southbound.